Either way there is a panelled door covering a built in/integrated electrical appliance- but I see there is a handle now. I'm trying to explore handle free options for my integrated fridge and microwave.... so far have come across Blum's amazing electrical "Flex Sensor" drive. not cheap but th only option that I've seen apart from a groove in the top and bottom panel of the fridge to assist with opening. has anyone else got any ideas? Sorry but i just noticed in another comment you told someone the colour was Polytec graphite matte?? These encaustic tiles are great! Where do you source them from? Hi Dana, They were from Earp Bros tiles. Cheers. Drying cabinets - Hi, is the cabinets next to the sink drying cabinets with ventilation grills on the top and the bottom? Is this designed to dry clothes with a heater inside? Thank you. Hi Jasmine. Thank you for your question. They are actually just normal linen cupboards with extra ventilation as requested by owner. Cheers. cabinet color - can you tell me what color/finish the cabinets are? 9. 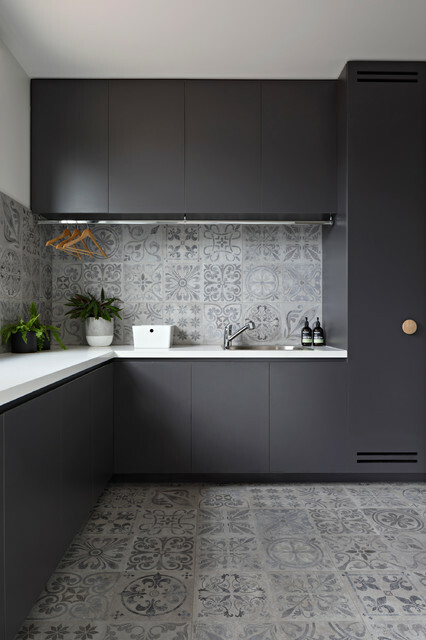 Location: Melbourne, VictoriaWhy we love it: A deep, moody colour palette, patterned encaustic tiles on the floor and splashback… whoever said that a laundry can’t be luxe? The laundry is next to the rumpus room and the encaustic tile also features on the splashback and floor, with charcoal-coloured joinery to complement. Polytec melamine joinery in cinder.